Mondo Guerra has designed new shirts to be sold at Piperlime.com. They go on sale at midnight tonight and a portion of each sale benefits amfAR. 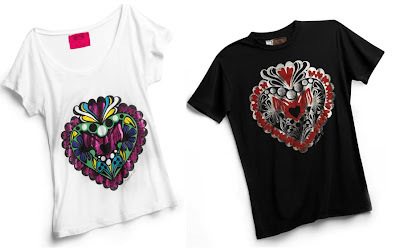 UPDATE: "Mi Corazon" T-shirts are $50.00 and $20.00 goes to AMfar. Click here to shop. Click here for Lifetime's official page for the show and click here for a slideshow of Heidi's funniest moments. Tim Gunn's Horoscope and a Trivia Contest! This is really fun - click here for "Why Tim Gunn is Such an Amazing Human Being." 1. 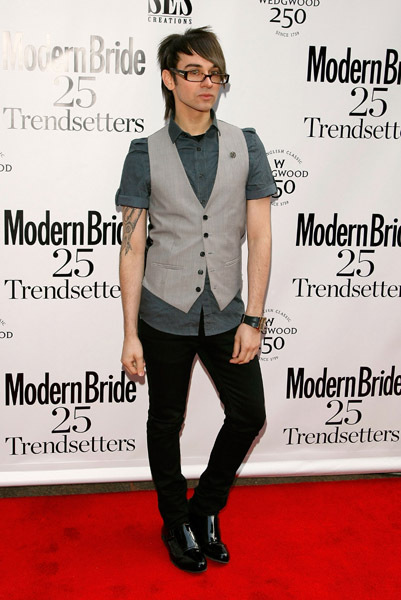 This photo was from which season and episode of Project Runway? 2. Who was the guest judge? 3. What was the name of the Art Supply Store where the designers shopped for their "extra" supplies? Please do not leave your answers in the comments. Click here to send them to BPR. Update: We have a winner! Congratulations Harris. 1. Season 3, "Waste Not"
Thanks to everyone who sent us your answers. Please stay tuned for more contests. Heidi Klum wears a "Short, Tight and Shiny" black dress to InStyle's Best Of British Talent Party on January 25, 2011 in London, England. Also, the Project Runway host has signed a deal to provide online content for AOL.com. Read the full announcement here. Tim and Joy discuss "State of the Union" fashion. Project Runway Poll: Which Show are you Most Looking Forward to? Click here for a new interview with Christian Siriano. Christian talks about living in Chelsea. Christian reveals that he is planning to open a retail store! Althea Harper is blogging for ElleGirl! Click here to read about Althea's preparations for fashion Week. The Project Runway Season 6 finalist also has a design on the cover of TomTom magazine. Click here for more. 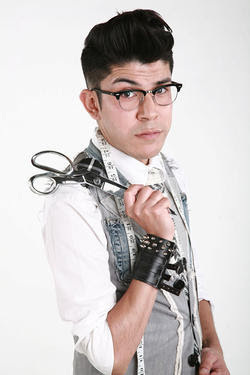 Click here for more about Seth Aaron and Mondo Guerra's Q&A at The ALT Summit. More photos here. It's the big finale tonight for The Fashion Show: Ultimate Collection on Bravo as Dominique Pearl David, Calvin Tran and Jeffrey Williams go needle-to-needle as they vie for the title of Season 2 champ and the $125k prize. Our loyal crew of party room fans will be watching together live on our sister site Blogging Bravo and we invite you to join us. Even if you haven't been following along, drop in and say hello. It's finale night, who will design The Ultimate Collection? Another Spinoff - "Project Runway: Masters"
The Wall Street Journal reports that The Weinstein Company is developing "Project Runway: Masters" in addition to the previously-announced "Project Runway: Accessories"
"As part of their television push, they plan to launch two spinoffs of "Runway" this year: one called "Project Runway: Masters," in which professional designers compete in fashion challenges to earn money for their favorite charities. Another is titled "Project Runway: Accessories," where designers create new clothing accessories each week." Who would you like to see competing in the "Masters?" 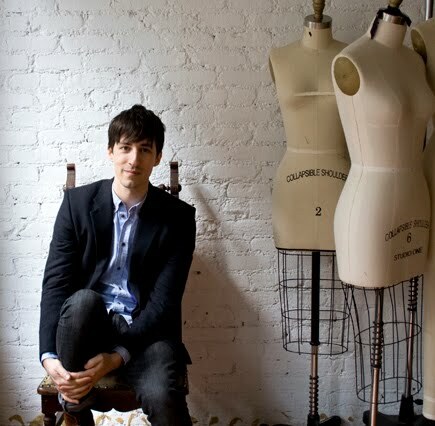 Project Runway Season 5 designer, Suede has updated his website and has lots of great news. Suede's pattern collection for Simplicity will be available in February. Click here for the story and video featuring Project Runway Season 5 model, Karalyn West. Next, Suede will be in Anchorage Alaska on January 27th to judge the "Object Runway" design contest at The International Gallery of Contemporary Art. Click here for more information. On Saturday, Jan 29th, Suede will be at the CHA (Craft and Hobby Association) Trade Show in Los Angeles. Suede will be at the Simplicity Patterns booth. Click here for more information. Thanks for the update, Suede! Click here to see more photos of Irina's designs. Heidi Klum Shine fragrance is expected in stores this fall. "I am thrilled to be partnering with Coty on my new fragrance," said Heidi Klum. "Working for a long time on developing a signature scent and watching it finally come to life is so exciting. I never thought my nose would recover from sniffing so many scent combinations but it is all worth it. I want my fragrance to be truly special and head-turning so that people ask the woman who's wearing it 'What are you wearing? You smell delicious!'." Labels: All Heidi - All the Time, Heidi Klum, Is there anything she can't do? 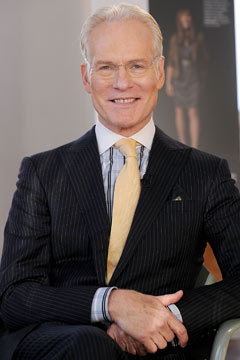 Click here for a new interview with Tim Gunn from StyleList. StyleList: You've already put out two books. Are you working on a third? TG: Yes. I'm very excited about this new book. It's an etymological guide to what's in your closet. I take basic items and track their lineage all the way back to Egypt, where it all began. It's a way of presenting fashion history in a way that I hope is accessible to people and that they find engaging. I want people to know that when they take that wrap dress out of the closet, that there's a history. It didn't just appear on the scene, it goes back centuries and centuries and has an interesting timeline. Project Runway Season 2 designer, Kara Janx will be featured in the new show "All on the Line" on the Sundance Channel. Best wishes to Season 5 designer, Jennifer Diederich and Claudio Guarducci who are engaged to be married in June. Click here for details. Project Runway has been nominated for an award in the "Outstanding Reality Program" category. Congratulations to our favorite show! Click here for a new interview with Tim Gunn from Parade. 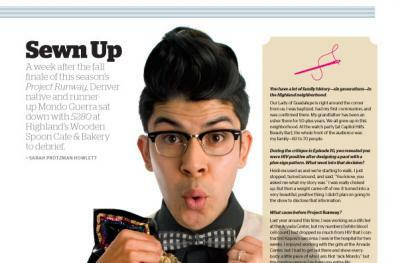 Click here for a new interview with Mondo Guerra from InDenver.com. Project Runway Season 7 designer, Anthony Williams designed the inaugural ball gown for Dianne Bentley, the First Lady of Alabama. Click here for the story from wsfa. BPR Field Reporter, Kenda Nunez attended the launch party for Irina Shabayeva's INC International Concepts collection and sends us this report. Thank you Kenda and Irina! Project Runway Season 6 winner, Irina Shabayeva joined forces with INC International Concepts to launch her Spring/Summer 2011 line available exclusively at Macy's. The event was held at the modern Trump Soho Hotel Tuesday, January 18th. A beautiful penthouse surrounded by glass with a New York City Skyline was the perfect background for this modern collection. The area was full of industry insiders and photographers that wanted to see what Shabayeva had created. The designs consisted of everything a woman needs in her closet; dresses, separates, denim and really cool outerwear. Some of the pieces had color blocks, others flowed delicately, and were peppered with beautiful embellishments. There were also jersey dresses that were rich jewel tones. This line can be described as wearable and fun and most importantly, beautiful. The best part about the line is the fact that it’s available with great prices at Macy's. The collection ranges in price from $49-$159. The line will be available at stores starting February 19th in 50 Macy’s stores throughout the country including Herald Square (New York) and online at Macys.com. Ms. Shabayeva and her team welcomed Blogging Project Runway and gave us one of the first interviews of the night. She was wearing one of her designs and looked great. Irina explained that making every woman feel beautiful is one of her inspirations. She told us that dance and fluidity were a big part behind this collection. Please listen to the interview for insight into this launch and more from her. It’s great to see the talent of all Project Runway designers beyond the competition and to learn about their achievements after their involvement with the show. PS: As I was leaving the party I passed by the DJ booth and noticed, she was wearing one of Irina’s designs, not only did she look great! How nice to see the everyday woman look modern and flirty at affordable prices. It's the last call for The House of Nami and The House of Emerald tonight on The Fashion Show: Ultimate Collection as we find out who goes through to the Season 2 finale. Our merry band of party room regulars will be on hand again to watch it all go down on our sister site Blogging Bravo and we invite you to join us. Doors open at 9:30 p.m., hope to see you there! Heidi Klum arrives at the 68th annual Golden Globe Awards in Beverly Hills, CA wearing Marc Jacobs. I don't know, what do you think? 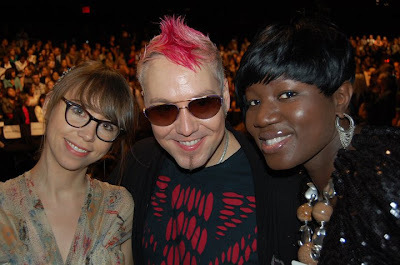 Click here for a new interview with Project Runway Season 8 designer Kristin Haskins Sims. Jonathan Joseph Peters will be presenting "The Garden of Colorless Flowers" Runway Show at StyleWeek Providence on January 22nd. Click here for more information. 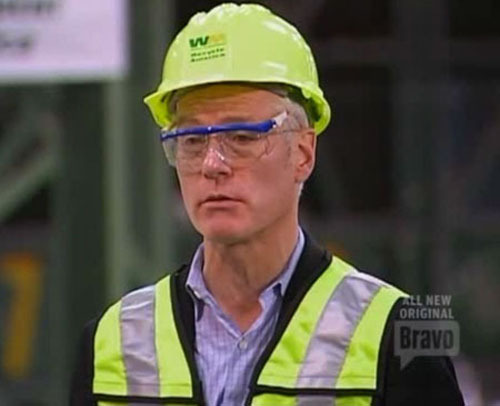 Click here to submit questions to Tim Gunn on CNN's "Connect The World" blog. Click here for a new interview with Mondo Guerra and be sure to tune in to Anderson Cooper's "AC:360’s" "Hope Survives: 30 Years of AIDS" special this Friday at 9 p.m. ET on CNN. 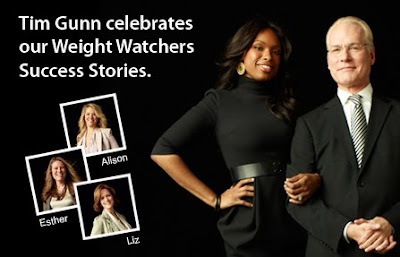 "I am so proud to be working with Weight Watchers on this extraordinary project and was so inspired by the stories of wonderful success. Nothing makes me happier than providing guidance and tips to help people look great as they lose weight and get healthier," said Tim Gunn. "If getting fashion right were easy, everyone would look fabulous, but it can be challenging. The combination of the PointsPlus program and providing helpful styling tips is great because it helps people celebrate their new look and recalibrate their thinking about style, while finding an enhanced self-confidence." 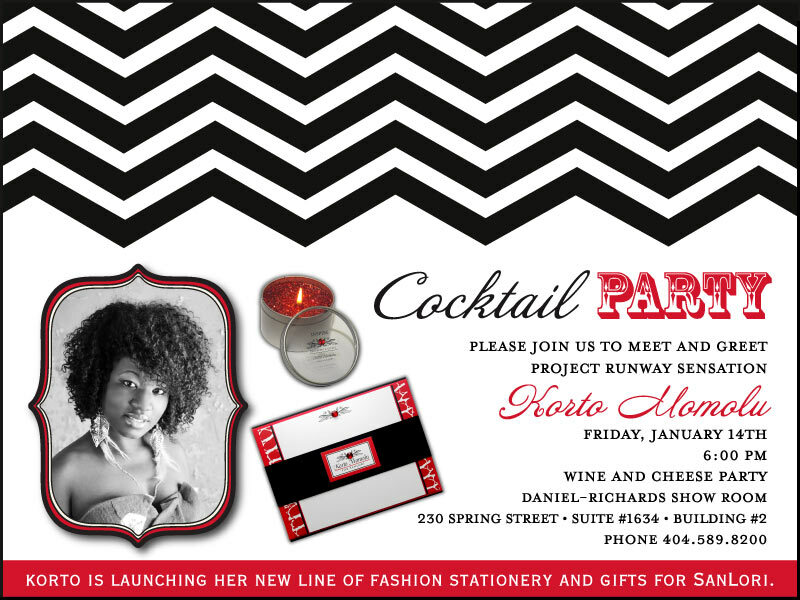 Project Runway Season 5 finalist, Korto Momolu will be in Atlanta on Friday night to present her new SanLori line (to retailers only) at The Atlanta International Gift & Home Furnishings Market. Click here to see and to shop the full product line. Click here for the SanLori Facebook page. One of the departures that Bravo has taken with The Fashion Show is in the explicit details revealed in their previews. The nature of the challenges, full looks at finished designs, guest judges and major dramatic elements typically verboten on reality competition show previews are all present here. Is it a planned marketing strategy to get viewers to watch or does Bravo just not care anymore? For those of you still tuning in, we will once again be hosting a viewing party on our sister site Blogging Bravo. Tonight it is "Eccentric Glamour with Simon Doonan". Party room opens at 9:30 p.m., come join the fun! The Project Runway Season 7 Champion designed a dress for 14-year-old Sara Turley. Sara is a cancer patient and Seth Aaron granted this wish for her. Heidi Klum's new show, "Seriously Funny Kids" will premiere Feb 1st at 9:00 on Lifetime. At a press event to promote the new Lifetime line-up Heidi admitted that she was disappointed in the Project Runway Season 8 outcome. "How do you think I feel?" says Heidi Klum, whose next Lifetime project is February's Kids Say the Darndest Things-influenced Seriously Funny Kids. "If it was up to me that day, it would have been different." -- Robert Bianco usatoday. Below, Heidi signs autographs and responds to a question about the next season of Project Runway. HP is sponsoring the Jan 20th Keynote Lunch: The Intersection of Design and Technology. Speakers will be Mondo Guerra, Project Runway Season 8 Runner-Up, Seth Aaron Henderson, Project Runway Season 7 Winner, and Stacy Wolff, HP Director of Notebook Design. The Project Runway Season Two designer talks about his design inspirations. Click here for the full interview from Terrificmag.com. The new show premieres on Lifetime in February. Disney teen star and purported girlfriend of Justin Bieber (did you ever think his name would show up on BPR?) Selena Gomez wore a gorgeous dress by Project Runway Season 6 winner Irina Shabayeva last night at the People's Choice Awards, where she received the Breakout Artist of the Year Award. Congratulations Irina, we think she looks fabulous. What do you think? Congratulations to Sara Rea and to ALL of the Project Runway producers for the nomination! The category is "Outstanding Producer of Live Entertainment and Competition Television." Happy New year competitive reality fashion show fans! As we slog our way through a very lengthy Project Runway off-season, we remind you that Bravo is continuing to run The Fashion Show:Ultimate Collection to help fill in the void. We have a dedicated group of BPR party regulars who have been watching this campy mess and we invite you to join us. It's a team wedding challenge tonight with Rachel Zoe and Johnny Weir sitting in as guest judges. With just six designers remaining, the drama potential is major. Calvin Tran has proven to be a Grade A crazy contestant, it's a wonder Project Runway has never cast him. The Fashion Show party room opens at 9:30 p.m. on our sister site, Blogging Bravo. Come join the fun! Project Runway Season 2 Champion, Chloe Dao is featured in the new issue of Houston Lifestyles and Homes magazine. Any offers on the table? I don’t want to jinx it, but as you saw in the finale, Heidi was really fighting for me—her main management company has contacted me. My dream is to provide a product that makes people enjoy their life. It’s silly—after all, they are just clothes—but they change the way people walk down the street.